Sprint’s (NYSE: S) Next-Gen Network investment is taking hold across New York and wireless customers in Manhattan are experiencing Sprint’s best-ever LTE Advanced network with new independent testing showing Sprint tops the charts in speed and data reliability. "Our Next-Gen Network investment is making a difference and we’re seeing tremendous performance in Manhattan and across the greater New York City area," said Mark Walker, Sprint’s vice president for Network, Northeast. "We’re excited to roll out the most advanced technologies in wireless to give our customers faster data speeds and stronger reliability, all on a Network Built for Unlimited." This year, Sprint has spent billions on its Next-Gen Network build, unleashing the company’s strong spectrum holdings to dramatically improve coverage, speed and reliability for its customers. Across New York City and the Tri-State area, Sprint continues to add new cell sites and upgrade existing cell sites to use all three of its spectrum bands (800 MHz, 1.9 GHz and 2.5 GHz) to improve coverage and provide its fastest, most reliable service. The company has also added thousands of indoor and outdoor small cells throughout the greater metropolitan area to deliver even more coverage, capacity and speed using unobtrusive units on telephone poles, street lights and other infrastructure. Sprint has also rolled out LTE Advanced technologies including 256 QAM, 4X4 MIMO, enhanced Beamforming with Transmission Mode 9 (TM9) and two- and three-channel Carrier Aggregation for faster data speeds. In addition, Sprint is enhancing its upload speeds with capabilities such as Uplink Carrier Aggregation, 64 QAM and High Performance User Equipment (HPUE). These technologies provide the foundation for Sprint’s LTE Advanced capabilities, now available nationwide and delivering up to 2X faster speeds on capable devices. They have also helped make New York City one of 225 cities where Sprint offers incredible Gigabit Class LTE performance for customers on capable devices. To spread the word about its network improvements, along with offering the best value for Unlimited with Basic, Plus and Premium plans and other great holiday deals, the company is conducting an aggressive marketing campaign through the holiday season. Efforts include TV, radio, outdoor and digital ads, along with in-store signage and materials. Sprint 5G Coming to NYC! Sprint’s execution of its award-winning 5G strategy is well underway. The company is deploying 5G-ready Massive MIMO radios in New York City to launch its mobile 5G service in the first half of 2019. Massive MIMO is a breakthrough technology that dramatically improves the capacity of Sprint’s LTE Advanced network with equipment that is software upgradable to 5G. Sprint’s 64T64R Massive MIMO radios support split-mode, enabling the company to offer LTE and 5G simultaneously on the same radio. Initial results from early deployments show Massive MIMO is driving a 4X average increase in capacity and speed with peak increases up to 10X over LTE. 5G promises new levels of innovation and progress to connect people, places and the billions of things Sprint customers do with blazing fast speed and ultra-reliable wireless connectivity. With Massive MIMO at the foundation of its mobile 5G service, Sprint can keep meeting its customers’ demand for unlimited data and high-bandwidth applications. To follow Sprint’s Next-Gen Network build out and its road to 5G, visit http://newsroom.sprint.com/network/. 1 RootMetrics New York City testing: 2H 2018. Chart represents Median Downlink Throughput speed. Tested with best commercially available smartphones on 4 national mobile networks across all available network types. Your experiences may vary. The RootMetrics award is not an endorsement of Sprint. Visit www.rootmetrics.com for more details. 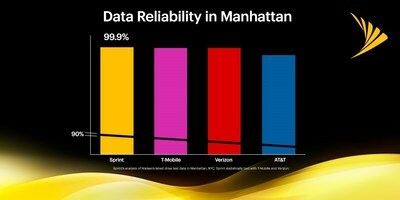 2 Sprint’s analysis of Nielsen’s latest drive test data in Manhattan. 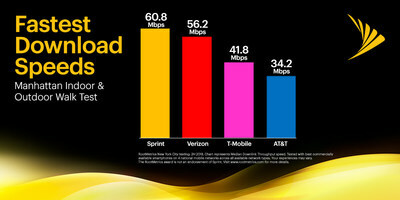 Sprint statistically tied with T-Mobile and Verizon.